� In 2015 Tramblie advanced to his first two career AVP semifinals, winning once. � Entering the 2016 season, three of Tramblie's four best AVP career finishes have come in his last eight events, with those three coming with three different partners. 2015: Tramblie opened the year with Marchewka, then teamed with Trevor Crabb for the first time and they finished third. After one more event with Crabb he partnered with Brad Keenan for three events. In their first one together, in Chicago, they won all five matches including three against teams seeded fifth or higher en route to the title. Tramblie was fourth in digs per set (4.98). 2014: Tramblie played in seven AVP events with four different partners, with a best of fith. He ended the season ranked eighth in kills per set (6.45) and 10th in digs (4.64). Tramblie and Avery Drost played in one FIVB qualifier as well. 2012: Played in five domestic tournaments and advanced to two semifinals. 2011: Tramblie played eight domestic events on three different tours, with a best of second. He also made his FIVB debut with Morrison, losing in the country quota match. 2010: Tramblie and Marchewka had a best of ninth in five tournaments together, then Tramblie ended the season with a pair of events with Fred Souza, also with a best of ninth. 2009: Tramblie played one event with Austin Rester, then five tournaments with Russ Marchewka, getting a best of ninth. 2008: In the season opener Tramblie played with Scott Lane, but then played the remaining 15 events with Morrison. The duo had a best of fifth, at the time a career best for both players. 2007: Tramblie began playing with Mike Morrison, and in 14 events together played in the main draw 12 times. He also played one tournament with Hildebrand, finishing 25th. 2006: Tramblie played with Tyler Hildebrand in what was Hildebrand's beach volleyball debut, they were seeded 56th in the qualifier but advanced to the main draw. On the season the duo played nine events, advancing from the qualifier five times and getting seeded directly into the main draw in another event. They had a best of ninth. 2005: Played in four AVP qualifiers with Geoff Cryst but did not advance to the main draw in any of them. 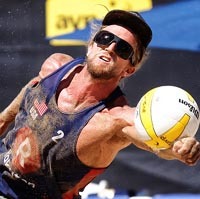 2004: Tramblie played with Billy Allen in what was Allen's beach volleyball debut, they were seeded 66th in the qualifier but advanced to the main draw. They competed in two other qualifers later in the year. 2003: Played in two AVP qualifiers with two different partners, but did not advance to the main draw in either. Personal: Tramblie was the setter for Cal State Northridge, recording the fourth-most assists in school history. He earned all-MPSF honors for three seasons, and was a second-team AVCA All-American as a senior after guiding the Matadors to victories over 13 ranked teams in 2004.